you got it allison. you got it raw! It is crunch time. The time is crunchy. There is less than a month till my manuscript is due, and just over a month till Tim and I go to America for a holiday. We’ve been having three photoshoots a week, we’re surrounded by cakes, and it was only as I, with primal instinct, rapidly transferred handfuls of fresh clean spinach leaves by the handful into my mouth while Celine Dion’s Power of Love played in my head, that I realised I haven’t eaten a lot of vegetables lately. I’d like to add that I’m not saying this in a “now I need to go for a jog to work it off!” kind of way. Just that my nutrition has been at the mercy of whatever it is I happen to be preparing for photoshoots on a given day. And: I feel great! – I was on the way to the supermarket today to pick up some ingredients, checked the mail on the way, only to find a letter from Mum to find a much needed, much appreciated supermarket voucher. – I had to make a pavlova at 11pm on Friday while feeling a little queasy. Said pavlova inevitably failed, when I went to check on it the next morning. A snap decision was made to make another one again, an hour before a photoshoot. It mercifully worked. – Did I mention I was making said pavlovas with nought but a whisk and a bowl (and ingredients too of course, smarty-pants.) Have been pretty much unable to use my right arm ever since. It’s weird, because I make cakes and whip cream and so on with a whisk all the time. I think the franticness must’ve made my muscles extra tensile. – I have been paying what feels like obscene amounts of money for out-of-season fruit and vegetables. Since winter is here the only thing actually in season is one sole, limp, rapidly browning parsnip. And it is $7. -Breaking: a hangover from a ridiculously enormous party is not conducive to wanting to test lots of recipes. And yet still I cooked. – The kindness of friends continues to bring joy. Jo lent me her mother’s wonderful pottery. Willow lent me some glorious tablecloths. Martha of Wanda Harland gave our plate collection an early boost by loaning us some beautiful stuff. Jason (one of the photographers) bought pretty much the most stunning dessert spoons I’ve ever beheld. And it goes on. – Since I have been making so, so, sososososososososo much food for photoshoots and general recipe testing, it has been persistently difficult to find time and energy and – importantly – general hunger to make food that I can blog about. There’s just no chance to be hungry. Don’t get me wrong. As far as problems go, this one is pretty wonderful, what with it being because I’m writing a cookbook and all. But still! This is why these marinated tamarillos are perfect. Sharp, sweet, aromatic, spiced. 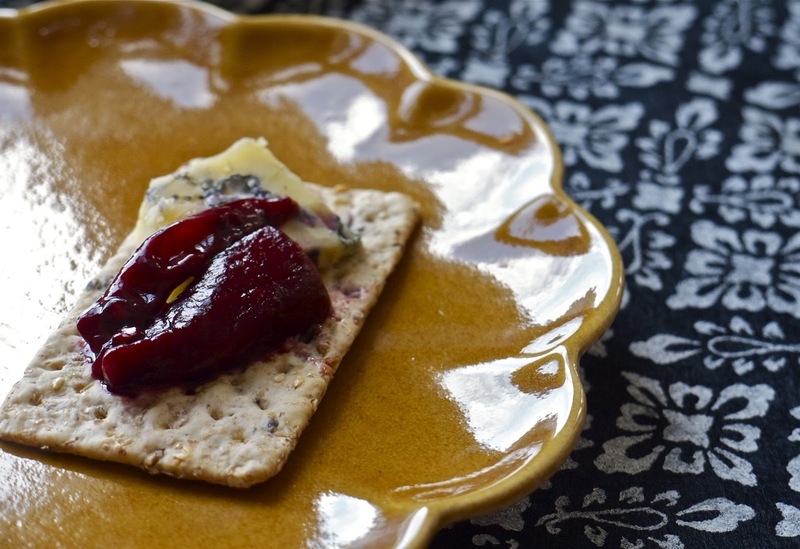 Small slices with a cracker and some cheese makes for a snack of thrillingly punchy flavour and relief-inducing smallness. Frankly I really just love eating them with a spoon. Recently I was able to attend a demonstration from Megan at little bird organics. It was a supercool experience, as she took us through making several courses of food – all raw. Their ethos is about food tasting and also making you feel amazing, and this recipe from the evening in particular caught the attention of my tastebuds. Clearly I am not a raw vegan, or even vegetarian, but I enjoy being inspired by people who love food, and being exposed to new ideas. Which is exactly what happened. Thanks so much Megan for allowing me to share this recipe here. Because it is freaking delicious. With huge thanks again to little bird organics for the recipe, that I have adapted ever-so-slightly. Slice the tops off the tamarillos and using a sharp knife, slice off the skin. Then slice the newly naked tamarillos lengthwise, or however you please, really. Place them in a bowl. Pour over the honey and the wine, spear with the cinnamon stick and the cloves, and grind over plenty of salt. Cover with plastic wrap and refrigerate overnight. I don’t have a dehydrator, but the recipe recommends putting them in it if you do. There will be a lot of syrup – I just drained it off. I held on to it because I have a feeling it’ll be fantastic topped up with gin and soda. Something in the salty, wine-deep intensity of these is quite compulsive. I love them. It may look like you’re making tons, but you’ll get through it all easily, I promise. Best of all, tamarillos are actually in season here and reasonably priced. But once they’re gone, I think I’ll try making these with sliced pears, and then next Autumn, perhaps I’ll make it with feijoas. 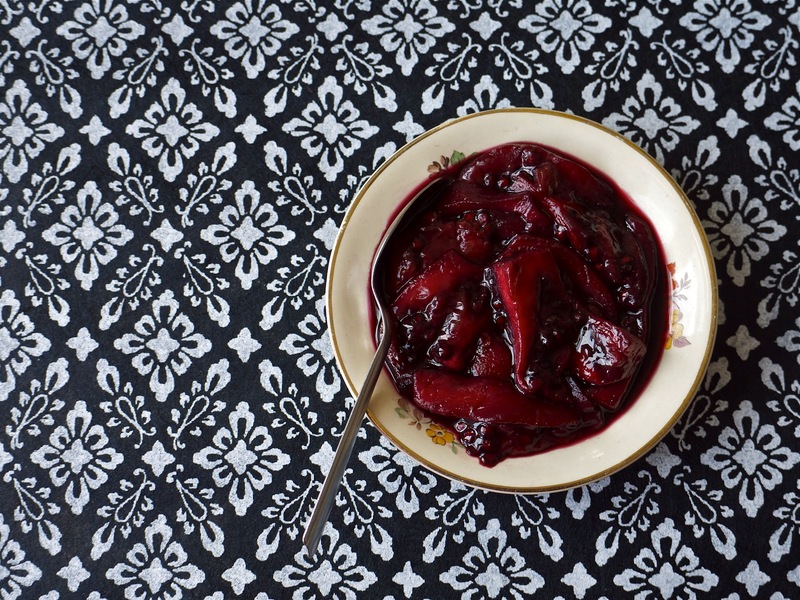 Inbetween times, I predict this would also be a wonderful marinade for sliced plums…all I’m saying is, there are options for you outside the realm of the tamarillo. But it’s a very, very good start. I saved the best montage scene for last. This afternoon I had to make a [redacted] pudding for tonight’s photoshoot. It felt like it was going to be highly straightforward. Well. I screwed it up royally. It did not cook right at all. So I panic-ate it. I just…ate it all, in a kind of fugue state. It felt oddly logical, so I went with it, because that way it would be gone and the ingredients wouldn’t be wasted and so on and so forth. My second attempt at making the pudding failed also. Freaking out about wasting ingredients, about wasting precious time, about this stupid, sodding, straightforward pudding just refusing to work, I may have panic-eaten a goodly proportion of the second one, too. Luckily I came to and binned the rest of it, before my insides corroded. A few prickly, selfish tears were shed, I had some rescue remedy, and looked up pictures of Tom Hardy holding a dog. And, weary but sufficiently emboldened, I made a third go of that pudding. I could feel – perhaps a little irrationally – the ingredients not quite coming together the way I intended them to, but shunted it hatefully into the oven all the same. As soon as I could ascertain that it was not entirely successful, but at least relief-inducingly good-enough…I lay down on the ground and drank some vodka. 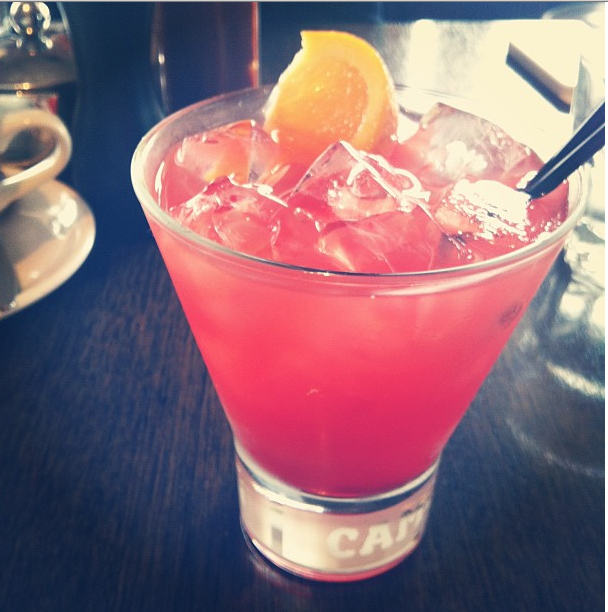 A large Campari. If you can’t be fancy, you might as well fancy yourself as fancy. PS: If you’re in Wellington and feeling able and up for it, there’s a Celebration Rally for Marriage Equality on Wednesday 29 August at noon in Civic Square. This is so important! I’m not sure that I’m going to have time to make a sign or anything, but I’m definitely going to be there. If you’re interested, click the link for details. Title via: Normally I quote songs but this is a line from a movie – a musical comedy, in fact, but the point is, it is Cry-baby. An over-the-top, hilarious, sweet, wonderfully bizarre movie from John Waters starring a young Johnny Depp who overacts deliciously when saying such quotable lines as the title for this blog post. Also: there is Wanda Woodward. Find it, fast. Over at Lani Says I got wise to the ways of Jessie Ware. Her song Wildest Moments is LUSH. Safety Dance, Men Without Hats. Make of this what you will. I can’t help loving this ridiculousness. And if your friends don’t dance then they really are no friends of mine. Never not obsessed with the musical Hair. Here’s Flesh Failures/Let The Sun Shine In from the original Broadway cast. Next time: Next time, I’ll be ever closer to the manuscript due date. And therefore you can look forward to me making even LESS sense than I did in this post. Good times, good times. i’ll drink to that, and one for mahler! Sounds like you are rocking this cookbook with help from friends and the occasional vodka. Beats having a kitchen melt down a la Julie in Julie and Julia. Keep rocking. I ain't neva eva heard of no tamarillos before. That said, I'm growing some sweet tomatillos in my garden, and if they ever decide to ripen, I'll use some of them in this manner. Mmm, vodka enjoyed while lying on the ground, whilst admiring gigantic piles of cake everywhere around you. Sounds nearly relaxing! Still need to get your cake round and plate back from Abby!! Sorrrrrrrrry! Ohhhhhhh!! That explains it!! For some reason I thought you had a year to complete the manuscript, so I was surprised by how quickly the photoshoots leaped into existence. One month! YOU GO GIRL I WANT YOUR CAKE AND YOUR FACE AND AMERICA WOOOOOO P.S. omg I might MIGHT be in New York at the beginning of October briefly for a few days?? Noooo! It's due so, so soon! America! AMERICA! OMG. WHAT EVEN. So excited about the possibility of crossing paths with you that coherent sentences are NOT A PRIORITY. Hmmm, tamarillos might be more of a southern hemisphere thing. I sort of was working on it before the announcement, but nothing concrete – basically these days if I'm awake, I'm working on it. I love raw food and just had Little Bird macaroons (from the Food Bloggers Conference Goodie Bag! ), yum as! 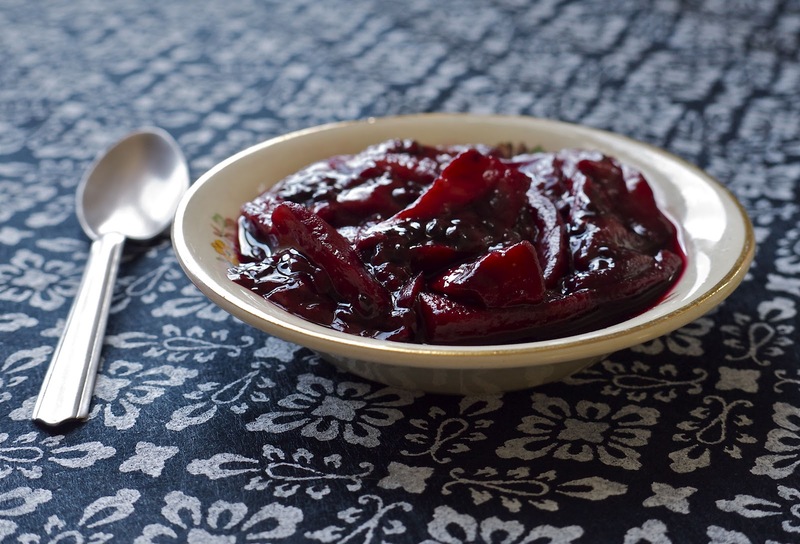 Last month my boyfriend's mum couriered us 8kg of tamarillos and we preserved thim using almost this exact recipe except we simmered it all together in a stockpot for ages with some brown sugar too. And, like you, we used the syrup to make tamarillo gin & tonics which were SO good.